Owl have always been a mystery to the human kind. These creatures of the night with their big eyes are associated with one superstition or another but are definitely a sight to see. So, when they get roped in fiction, i.e., a good plot….well how could you miss it! 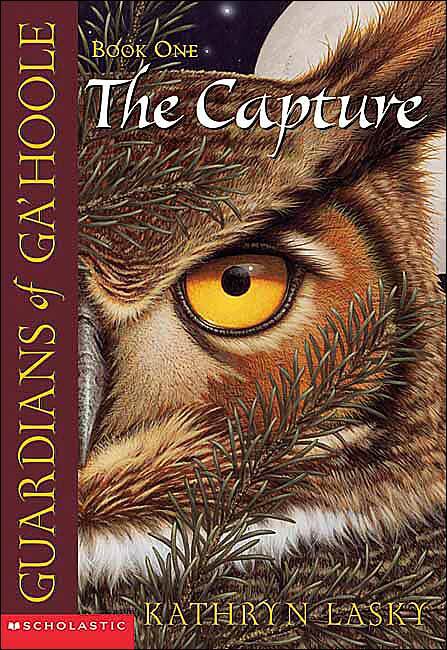 The movie Legend Of The Guardians: The Owls of Ga’Hoole was my introduction to the series. This book, #1 The Capture, is very different and I’ll tell you why. Born in the peaceful forest of Tyto, Soren the barn owl looks forward to a life of eating bugs and learning to fly, but evil forces have another plan for the owls. When Soren is captured and taken to a mysterious place known as St. Aegolius Academy for Orphaned Owls, he discovers the orphanage has a darker purpose. With the help of his friend, Gylfie, they set out to uncover the truth and find a way to escape. Unfortunately, the only way out is up, and the young owls will have to learn to fly if they have a hope of escape. Lasky portrays an owl world that has more in common with George Orwell than with Brian Jacques, offering readers big questions about human social psychology and politics along with real owl science. Broad themes related to the nature of personal choice, the need for fellowship based on love and trust, and sharing knowledge with one’s peers are presented compellingly and with swift grafting to the animal adventure story. Developmentally linked celebrations (such as “First Fur” and “First Meat”), methods devised for brain-washing (including the regimental marching of sleepy owls by moonlight), and the diverse landscapes in which owls makes their homes come to life here as Soren rebels against his captors, makes a friend, and executes the first stage of his planned liberation and family reconciliation. Lasky incorporates a great deal of information about owl behavior and translates it into the customs of a culture. The owls have rituals for their first bites of different types of food, for example, and for the stages of learning to fly. The St. Aggie’s scenes are creepy enough to get under even an adult’s skin, while still keeping the violence level appropriate for the target audience. There are a few deaths, but the details are mostly glossed over. Soren and Gylfie are inspired to heroism, in part, by the legends of Ga’Hoole, which are kind of like the owl equivalent of the Arthurian cycle. I really like the idea behind The Capture, which is that one should be brave in the face of tyranny and that stories can help build that courage. The book would have been stronger, though, if a few of the legends had actually been worked into the story. We often read that one character is telling the Ga’Hoole stories to another, but not what’s actually in those stories. I’ve been a mythology geek for at least twenty years, so it’s pretty easy for me to imagine what the stories are probably like, but I wouldn’t necessarily expect a child to have the same knowledge base. There’s a constant action, and constant thinking between the owls. All the details are very graphically presented. So much so that the reader can actually imagine every tiny bit of detail presented to us. The songs….well in all the seriousness of presented in the plot and the melancholia of the protagonist the songs, be it the Catterpillar song, Twilight’s songs or the songs sung at St. Aggie’s provide us with a bit of a laugh. Now I don’t know about you all but listened to all book in audiobook format, so the reader provided us with wonderful rhyming songs that were pretty hilarious to listen to. This being the #1st book of a series of 15 is quite short and at its end its “To Ga’Hoole” they went. I was not aware that this was a series. I saw the movie with my daughter. It was amazing.